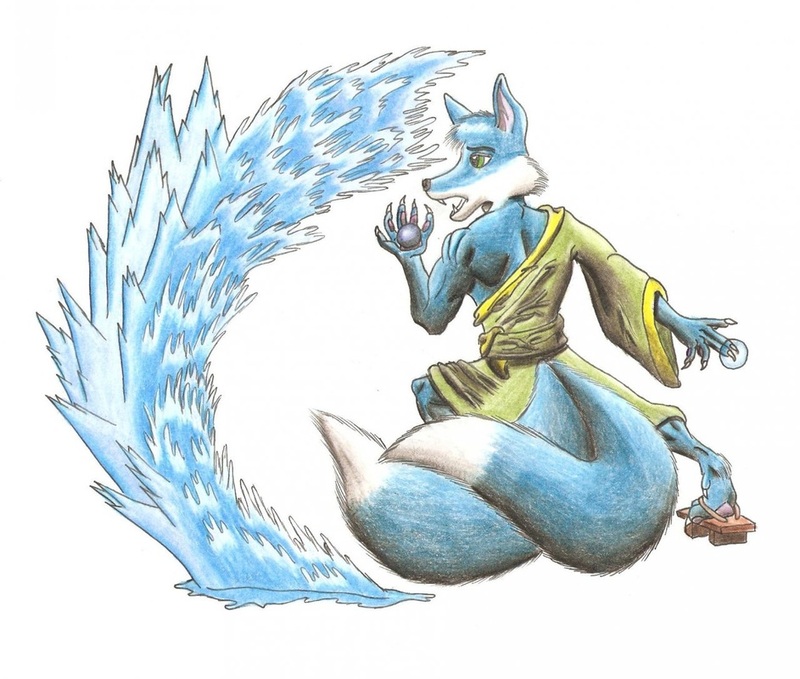 (pronounced: Nee-doh-nee-moh) is an anthropomorphic blue fox, and also the first brainchild of his creator, Zachary Geyer. He was born out of a username his creator used on a video game spoof animation website forum in the late 1990's and grew to become known as the "Blue Fox of Randomism". His sweet and kind personality earned him many friends, and his often odd, quirky, and downright borderline manic behavior also earned him their loving-yet-cautious respect. He's kind, sweet, fiercely loyal, generous, and thoughtful. However despite his pleasant and friendly disposition, this fox has a tendency to exhibit some very violent behavior when given enough reason to lash out, usually in the name of protecting friends and family. He's not very physical, preferring more mental and creative activities instead like writing and reading. He loves to use magic, be it elemental magic, summoning, or healing. Over the years of playing online video games, Nidonemo would take new forms, and gain new abilities with each new incarnation. IT’S SUPER LUCKY MAILBOX TIME! YOU LOOK INSIDE AND FIND FUN FUN PRIZE! Needless to say the game delighted many of the mainland residents, while leaving the rest concerned about Nidonemo’s current dosage level of medication. While exploring a dungeon one afternoon, he came across a werewolf and immediately fell in love with him. They spent many nights in the dungeon corridors, unable to walk the surface world together due to his lover being a monster according to the people of the islands, and was subject to violent bigotry. One day Nidonemo managed to encourage the werewolf to the surface, and for the first time his lover walked on the grass and in the sunlight. The beautiful moment was put to a very sudden and incredibly tragic end, when a traveling group of villagers spotted the couple together, descended upon Nidonemo's lover with vicious malice, and tore him to pieces as they ignored the fox's cries and shouts for mercy. Bitter and angry at society, Nidonemo participated in one of the horrific "Cauldron Bombings" of Bomboria Trade house, which were quite popular acts of thief terrorism at the time before cauldrons were forged with safety enchantments to prevent these acts from being possible. Disgruntled people would fill an alchemist's cauldron to the brim with volatile or incompatible elements, clamp the lid shut, then place the cauldron on top of a trade table and cast an activating spell upon it, making the cauldron explode like a shrapnel bomb. It was said that bitter tears of rage stained his face as he screamed his lover's name before Nidonemo detonated his cauldron, killing everyone inside including himself and forcing everyone to respawn. Afterward, he fled Northwest to the mountains and isolated himself for a few months, weeping in silence. Emerging thereafter, the fox sailed to the Westernmost island of Samurai, Nidonemo was found by a member of the island's ruling body and after a pleasant conversation, was invited into their governing family. Following loyally under the Queen of Samurai’s rule, he became quite happy with his new Samurai brothers and sisters, during calm days he would go back to his old pastime of storytelling to the citizens visiting from the other island nations and the mainland folk. One day he found a book on the subject of Piety, and fascinated by this new skill of magical prayers and world of celestial deities, he set off to find a ruling god’s altar. Obsessed with this new skill, Nidonemo would go into seclusion for days if not weeks at a time, returning as if nothing had happened. People didn't think this unusual, as people tended to isolate themselves when fascinated over a new project or idea, but over time Nidonemo's once bright and friendly attitude began to sink into a grumpy and dark funk. His once silly and playful pranks upon the Bomy turned more violent and quite malicious. This more than unusual behavior continued until one day the altar crystal of Bile, the deity of Soul Eating and Harbinger of Death, burst and smothered the fox in vile essence that Nidonemo became possessed and wrought wonton destruction upon the lands. Veronica, a dear friend of Nidonemo and a devout follower of Bile's rival, the peaceful nature goddess Brigid of the earth, was in turn possessed by her own deity and fought to unravel Bile’s evil designs. After a truly remarkable and awe-inspiring battle, Brigid/Veronica were successful in tearing the spirit of Bile from within the possessed fox’s body, sealed it back in the altar's crystal, and thus healed him. Immediately afterward Nidonemo abandoned Bile altogether and began to follow the metal smithing deity, Govannon instead, and as an act of charity offered to bless the weapons of passerby whenever he was at the altar. As time marched on, Nidonemo frequented the land of Graal less and less, but he still can be seen once in a great while, casting spells in the fields or pillaging a haunted house, but these sightings are so rare they are thought to be myth. Nido, "The Feral Tarutaru of Windurst"
Almost two hours after his first steps into the world of Vana' diel in the city known of the Federation of Windurst, Nido was soon adopted as a son to Samanosuke and Reiswind and became a part of their large and comically dysfunctional family. With a head filled with dreams of becoming the best White Mage in the realm, Nido explored the world as much as possible, eyes open and filled with wonder. However his first venture did not go as planned, ambushed by an agent of the Dark Lord, Nido fell victim to a surprise attack by a Yagudo right outside the city gate. From then on, Nido harbored a deep, seething animosity towards the birdlike beastmen. Nido was infamously known as "The Feral Tarutaru of Windurst" Nido made it a life goal of his to be the bane of every Yagudo's existence after a tragic accident in the early days of adventuring involving a Yagudo ambush. If he wasn't terrorizing the Yagudo, he was performing horrifying acts of violence on any creature deemed aggressive outside the safety of the major cities, exploring lesser-traveled corners of the world on foot or on the back of Chocobo, spending time talking for hours with his close friends in groups connected by linkshells, or training himself in mind and spirit to become the most powerful Black Mage the land of Vana'diel had ever seen. Despite his violent, merciless, and bloodthirsty nature when it came to fighting monsters and foes, Nido was actually a very sweet young man. Ready to help his higher-powererd comrades when they needed it, but all too often his help would go denied, due to his inexperience and low power. After reaching his peak as a level 75 Black Mage, Nido began a new career as a Summoner. However after becoming frustrated with the pre-existing role Summoners were given in modern battle party society as more of an assistance role instead of the aggressive unit Nido so wished for them to be, he began staging Suicide Protests in the busy streets of Jueno, killing himself countless times by drinking vial after vial of poisons, but unfortunately gaining no support or attention. Bored with adventuring, unsatisfied with trips into the realm of Dynamis, and unwilling to change to adapt to dictated Summoner's protocol, Nido faded from the public eye and vanished. He has not been seen or heard from since, and his last known whereabouts were the Sanctuary of Zi'Tah where he was said to have been noticed by a band of travelling adventurers who witnessed him sitting upon a fallen log, looking up into the sky and humming to himself.